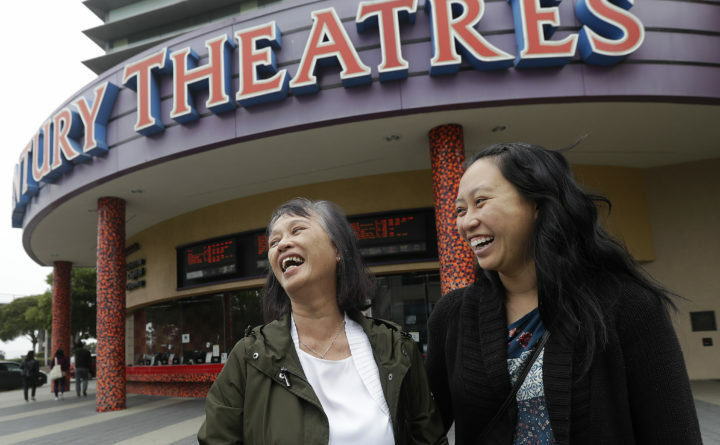 In this Thursday, Aug. 23, 2018, photo, Alice Sue, left, and her daughter Audrey Sue-Matsumoto laugh while interviewed after watching the movie Crazy Rich Asians in Daly City, Calif. It was Sue's second time watching the movie. When "Crazy Rich Asians" surpassed expectations and grabbed the top spot in its opening weekend, the film also pulled off a feat. It put Asians of a certain age in theater seats. Movie theaters are having their best summer in two decades, reversing the losses from 2017’s disappointing season and showing resilience in the Netflix era. North American ticket sales will close out the summer season with a more than 14 percent increase, research firm ComScore Inc. estimated, fueled by the outsize performance of Walt Disney Co.’s “Incredibles 2″ and “Avengers: Infinity War.” That’s the percentage gain since 1998. The season officially draws to a close with the Labor Day weekend in the U.S.